Prayer flags in the wind. All photos by Pavia Rosati. 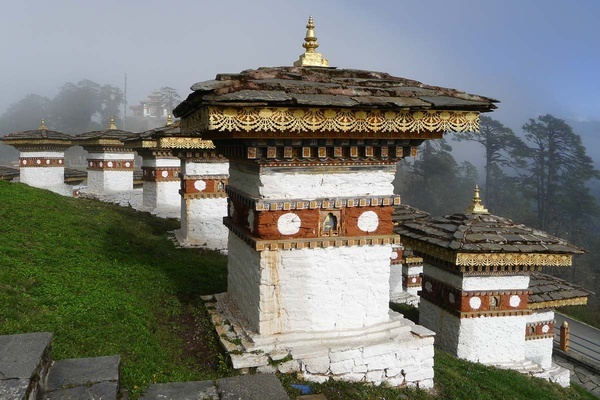 Popupla founder Pavia Rosati visits Bhutan and discovers what all the magic is about. BHUTAN – The food was terrible, the museums were non-existent, and I was stuck with a random group of strangers. To say nothing for the fact I spent as much time getting there as I spent being there. And yet, and yet, and yet: The few brief days I spent in Bhutan were among the best travel days of my life. 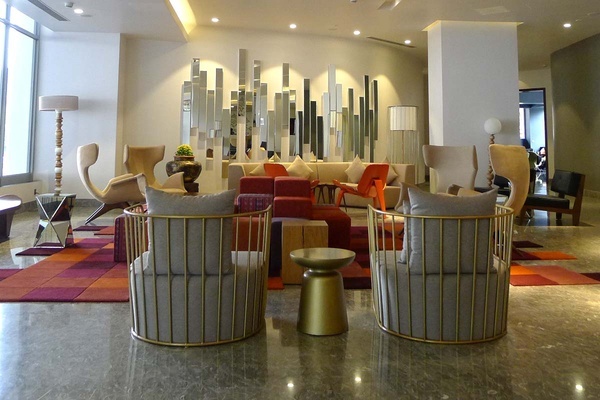 I was in Bhutan on a press trip to visit two new Le Méridien Hotels in Thimphu and Paro and to get a behind-the-scenes look at the latest installment of the happiness series photographer was shooting for the he creates for their hotels worldwide. I'm going to assume that most Popupla readers have never been on a press trip, so let me explain what they're all about. In a word, they're a total crapshoot. On the down side: Someone else plans the itinerary, which means you're at the mercy of another person's agenda, which typically involves some variation of "you're here to like my hotel/my restaurant/my unsung beach town/my sketchy country with a shaky human rights record." That same someone picks the other people you're traveling with. And when you're spending 14 hours a day with those people, one bad apple can definitely spoil the party. On the up side: If you select press trips with great care and accept them only very thoughtfully — which is the policy at Popupla HQ — you can find yourself in incredible destinations in hot-damn accommodations, getting insider access to places that are off-limits to regular travelers, with new friends and impressive colleagues. Which is what my trip was like. That's a long-winded way of explaining how I came to be in Bhutan for four days this spring with a handful of strangers on a trip so wonderful that I actually cried for most of the final drive from hotel to airport. The sweetness and the charm flowed from there. The airport in Bhutan, easily the most peaceful and beautiful I'd ever seen, was a single-room building whose exterior was painted in elborate motifs, as so many Bhutanese buildings are. Upon exiting the arrivals hall, I was greeted by the sight of a few dozen men wearing traditional ghos, the national robe-like garment made from beautifully woven and geometrically patterned textiles. I don't know why I was so moved by the sight of them, but I was. 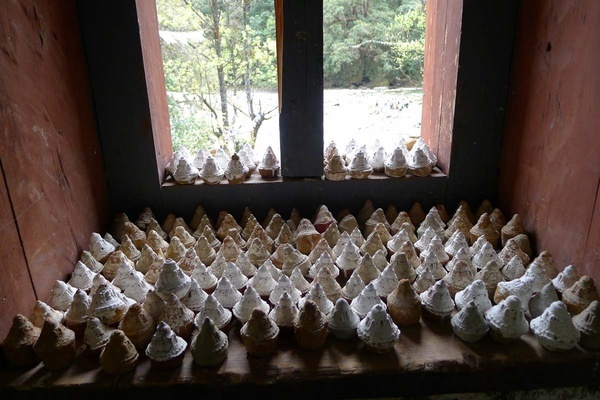 On the long ride to the capital city of Thimphu through sparesely populated twisty green valleys, I noticed something odd sporadically along the roadside: tiny one-inch mushroom-shaped huts with clay bases and white and gold tops clustered under nooks in the landscape. "Are those Smurf villages?" I asked my driver because that's what they looked like. They weren't, I was genuinely disappointed to learn, but rather stupas, clay offerings of positive energy that I would see everywhere for the next several days. Bhutan is a deeply spiritual country, and they're not afraid to let their spiritual flag fly — literally. The other thing you see everywhere are prayer flags. Scattered on the hillsides, covering bridges, strung between trees. 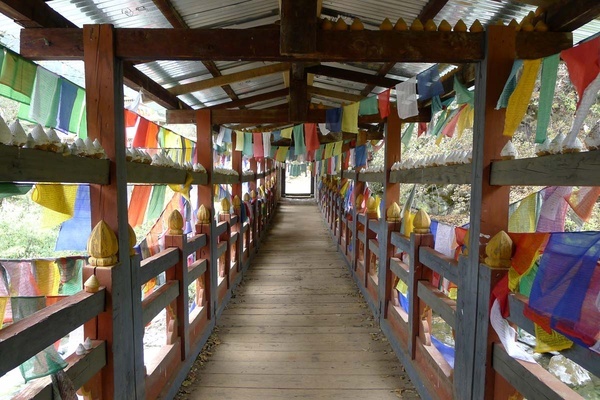 If you've seen a picture of Bhutan, chances are you've seen these vertical and horizontal prayer flags. Dragons and Smurfs: I was off to a good start! How could it get any better? With balloons. And that's what greeted me upon arrival at , a whole wall of them in the entrance. Gray Malin was in the middle of a shoot, and balloons were the motif he'd be featuring in his photos of Bhutan, because who doesn't see balloons and not instantly think "happiness?" Not me. Le Méridien's entry into the Bhutanese market is notable because it is the first big chain that the protective government has allowed to establish a foothold in the country, thus continuing the tradition Le Méridien established in its earliest days as the hotel offshoot of Air France, which pioneered flying to far-flung destinations around the world. 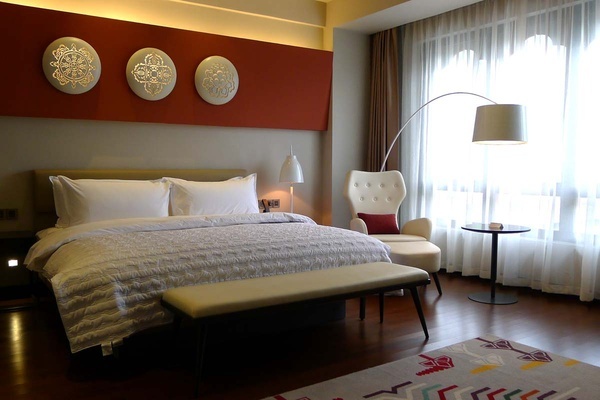 Until now, the hotel game in Bhutan had been dominated by the few luxury lodges operated by and , both much smaller and more independent hotel companies where you can't leverage your SPG points the way you can at Startwood-owned Le Méridien. To which I say, "feh." Maybe I'm too democratic, but I don't see why the country should belong exclusively to affluent travelers. True, I'd be disinclined to see legions of backpackers stinking up the joint with their dirty clothes and bags of crackers. But then again, I used to be one of those backpackers, and gross personal happiness was a primary motivator for why I started traveling in the first place when I was too broke to afford anything but crackers for dinner. The restaurant became a favorite spot because it served the only truly delicious thing I ate during my trip: dosas prepared by the Indian chef, who was amused that I ordered two for breakfast, two for lunch, and, just for good measure, a few around midnight. (Let's just say that ema datshi, the famous Bhutanese dish of melted cheese and hot chilis, didn't do much for me in the taste buds department.) The Latitude bar was a great place to repair for cocktails in the evening and to soak up the overdose of dosas. When you're in Bhutan, you're either sitting by a river or hiking up a mountain. Or sitting in a car driving through the country to get to a river or a mountain to do something great. At least that was my experience. It was an overcast and chilly day when a handful of invited journalists from around the world converged in Bhutan from our homes in Mumbai, Sydney, Singapore, and New York City. But the weather didn't deter Anjali Mehra, then Starwood's director of marketing for South Asia and one of our hosts for the trip. She piled us into a van and led us into the hills outside the capital to the Bhutanese Broadcasting tower viewpoint to see the city from above and to hang prayer flags. An auspicious way to begin any holiday. The site was a field of prayer flags, a veritable chaos of colored cotton sheets in varying states of disintegration. Bhutanese prayer flags consists of a series of rectangles, typically in the primary colors of blue, white, red, green, and yellow (in that order), imprinted with a prayer. They can hang vertically along a string (Lung ta, or "wind horse") or horizontally on a wooden pole (Darchor, or "flagstaff"). Anjali pulled out a Sharpie and had each of us make a wish and sign a prayer sheet, which fellow traveler and Starwoodite Simon Kopec and I then strung between two lucky-looking branches. 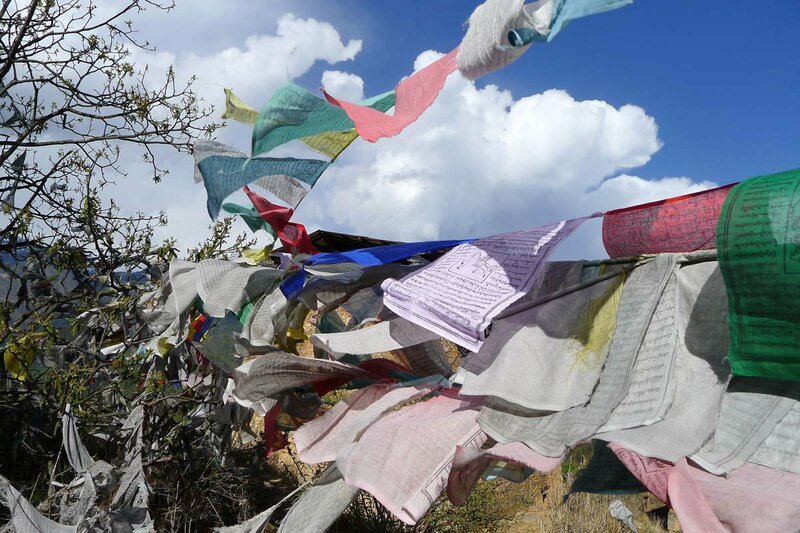 Prayer flags should be hung wherever the wind blows — which is why you see them on bridges and hillsides and in between trees — the theory being that the wind will carry the prayers up to the heavens. The flags eventually decompose into the surrounding earth and sky. From dust to dust, and all that. It's a beautiful thought, and one I considered even more carefully the next day during a long early morning drive from Thimphu to Punakha. We were going to , a site famous for its 360-degree views of the valleys and snowcapped Himalayas. I was with Anjali and Katie Cline, the manager of global public relations for Starwood who had invited me on the trip. Driving in cars with these two girls came to define a large part of my experience in Bhutan. The drivers who were with us throughout our stay were quietly possessive of their charges, such that if we tried to mix up our grouping and get into different cars, the drivers subtly ushered us back to our original configurations. Not that I minded one bit. Anjali and Katie were outstanding travel companions, and the conversations we had were at turns spirited, intense, personal, and racy enough to make a tough Bhutanese driver blush. We drove through the mountain woods that morning, climbing higher and higher. Rain and fog enveloped us, poised to ruin the day and the sole purpose of visit: the view. "Don't worry," Anjali said. "It will clear up." 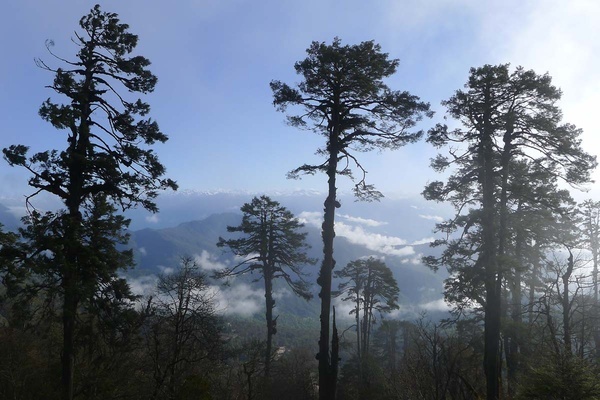 We reached Dochula pass and could barely see beyond our outstretched hands for all the clouds. I knew we were standing amid 108 chortens (Buddhist shrines) built in the early 2000s by Queen Mother Ashi Dorji Wangmo Wangchuk to commemorate soldiers who fought Indian rebels, but they weren't much more than dark shadows. We took hasty photos, the cold winds whipping as cold winds do, and dashed into the nearby cafe for refuge by the fire and steaming cups of suja (butter tea) and naja (sugar tea). And then in an instant the clouds lifted and the Himalayas did what they do best: stand their in all their stunning glory. We ran back outside for photos and to walk amid the chortens, which really are beautiful. And then the clouds came back with a vengeance, so we rushed back inside for shelter. And then the sun came back. This process repeated itself for about an hour, and, yes, I felt like I was stuck in a cartoon. Our next stop was , where the Rhododendron Festival was, as they say, in full bloom. We spent a few hours wandering the gardens, meeting Bhutanese children (who are disarmingly funny, friendly, clever, and, wow, gorgeous), watching elaborately costumed dance performances, and staring intently at fiesty yaks laden down with traditional bells and blankets. Really, the rhododendrons were the least impressive thing I saw at this great and lively place. So this is also what Bhutan was about: walking through gardens, taking selfies with eight-year-olds. Sitting on big rocks in riverbanks, chatting with Katie and Anjali. Walking around temple ruins like Drukgyel Dzong and learning about life in Bhutan over long conversations with Lam Chencho Dorji, the photographer and journalist who was traveling with us. Stopping the car by the side of the road to photograph pastel-colored houses and especially those painted with pretty phalluses for good luck (yes, really). Cruising the Thimphu nightclubs with Katie and Simon (yes, really), a dance scene that consisted of small groups of men dancing to the same Bruno Mars tunes that play in gyms across the globe. Spending so much time outside that I completely missed a gallery visit to and only had a half hour on my last night to shop the arts and crafts bazaar, an errand that would have been a priority anywhere else. And walking uphill to monasteries for great encounters with young monks. We made our way to the gardens at the base of , located on a mountaintop above us. We walked up the path, passing inspirational signs in elliptical English almost too peaceful to believe. Like this: "May I become never-ending wish-fulfilling treasure materializing in front and each of them as all the enjoyments they need." Well then. Indeed. 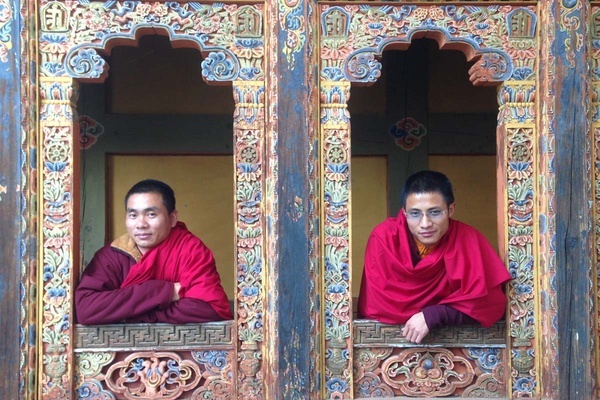 As we approached the entrance to the university, Katie and I saw three young monks walking towards us, a striking vision of flapping red robes. Superheroes of peace, they looked beautiful, if a little intimidating. (Would monks really want to bother talking to me, what with their busy prayer and peace-making schedule?) I stopped them on their path and asked if they would be kind enough to let me take a photo of them. Of course, they said, and posed like pros. We started going our separate ways, but I stopped them. "To town," one of them answered. "It's our day off." "Day off from school?" Katie asked. And so the conversation began. Within a few minutes, they were leading us on a tour of the university, showing us around the temple, the kitchens, the other temples, the classrooms, the courtyards, the entire elaborately painted and carved complex. It was a rare glimpse at the life as a young monk, a life that involves a lot of prayer, meditation, studying, and the regular things that 19-year-old guys do everywhere. We shared photos and videos from our phones and became Facebook friends and Whatsapp s.
"What do you guys do to get into trouble?" I asked. "Well, you know," they started to dodge. "Not much..."
"Come on," Katie said. "There has to be something." "Okay. Sometimes someone — and of course I don't mean me — might cut class," came the answer. "Or get drunk," said another, proving that Bruno Mars isn't the only universal thing around here. "What are you guys doing for the rest of the day?" I asked. "Want to hang out with us for the rest of the day?" Anjali asked. They looked at us and responded with the monks-in-training version of "what the hell" and joined us on the walk downhill, where we piled into cars and made our way to another riverbank dotted with prayer flags (literally: everywhere in Bhutan!) where Gray was staging a shoot with helium-filled balloons rising into the sky. Gray saw us approaching with our beautiful be-robed pals — and you could see the light bulb go off. Gray likes to shoot sweet and beautiful things, like bathers on a beach, llamas in a field, and giraffes on a savannah. 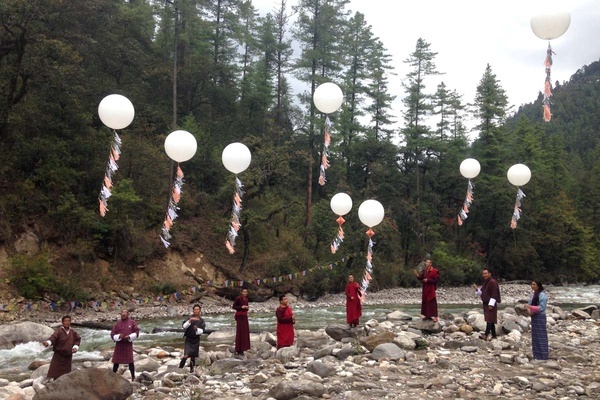 He wasted no time arranging everyone, monks included, along the river rocks, passing out balloons for everyone to hold. For 15 minutes he snapped photos of the assembly. When it came time for the next shot, Gray dismissed all the Westerners and rearranged those in traditional Bhutanese garments and Buddhist robes. Everyone was laughing like loons. A balloon popped in the wind. The scene was blithe and beautiful, almost comically happy in its lightness, in its unexpectedness. The following morning, I left before breakfast for the long journey home, first to Bangkok, then to New York City. Really. Is it any wonder I cried?